Bronies, adult internet nerds who love My Little Pony, have reached the crucial stage of any weird subculture's development. They're being cast on the Jerry Springer. Last night Jerry Springer tweeted out the above casting call. Bronies are not happy at the prospect. It's the latest leg in Bronies' slow march towards the mainstream. This month's Bronycon drew 4,000 mostly male Bronies to Seacaucus New Jersey and attracted the Associated Press, sending news of Bronies across the wire and to millions of probably very confused small town residents. It was only a matter of time before less savory media vultures swooped in. Howard Stern was first, mockinge Bronies on his show a couple weeks ago. Now Jerry Springer wants a couple Bronies of his own. FLIM FLAM ALERT! 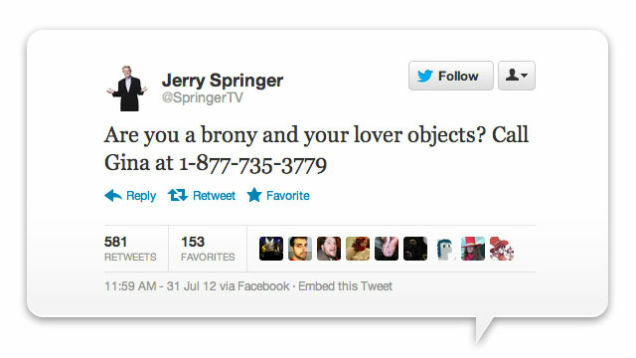 The Jerry Springer Show is evidently looking for bronies to appear on their broadcast. DON'T FALL FOR IT. They aren't trying to give positive exposure to fans of My Little Pony. They're trying to mock us. If Jerry Springer, or Howard Stern, or any similar broadcaster contacts you or a friend, asking you to appear on a show about bronies, say NO and don't let them persuade you. They're just out to make us all look bad. 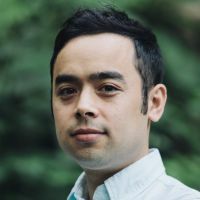 @springertv Why? So our fanbase can be ridiculed?
. @springertv You know the Brony thing is not supposed to be sexual, right? Please tell me you know this. I don't know, it might be a PR coup for a Brony and his girlfriend to scream at each other on Jerry Springer. It would show that Bronies can be sad, horrible monsters like any other American.